During his career Blake played for Cardiff City, Sheffield United, Bolton Wanderers, Blackburn, Wolverhampton Wanderers, Leicester City and Leeds United. 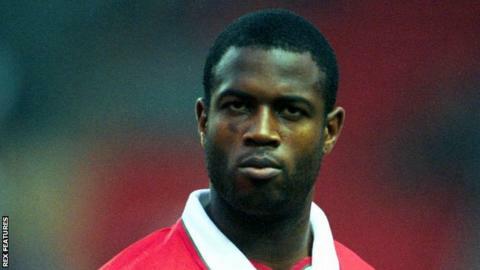 Former Wales striker Nathan Blake has branded Fifa's decision to scrap an anti-racism taskforce as "shameful". Fifa's taskforce was set up in 2013 to help tackle the issue of racism. Fifa general secretary Fatma Samba Diouf Samoura said: "It had a specific mandate, which it has fully fulfilled." Blake said: "It's almost turning a blind eye. It's almost justifying it [racism], saying 'we've done that and moved on' because it's never going to go away'." He added: "To say we've got a mandate and completed that mandate is a nonsense for me." He wants players from groups who have - and continue to - suffer racism to be heavily involved in future decision making. "I think you have to have the experience to understand it," he said. Blake also says that fears the 2018 World Cup in Russia could be marred by racism ignore what is a global problem. Earlier this year, football anti-discrimination group Fare documented more than 100 incidents of racist and discriminatory behaviour linked to Russian football over two seasons. And Manchester City midfielder Yaya Toure suggested that black players might boycott the World Cup, following the racist abuse he received during his side's 2013 Champions League game in Moscow. Blake said: "I wouldn't make it a Russian thing. I look at America and see black people getting shot. Racism is racism wherever it is in the world so whether the World Cup is in America or Russia is immaterial to me. "It's down to people and individuals and a way of thought. Blake says "things are better" than during his playing days, adding: "The difference now is the man who sits in the seat, you will still get the odd person coming out with a racist jibe, but it's frowned upon more. "But if you were racist 10 years ago going to football, chances you're not racist today is highly unlikely so it's just that you're not able to say it now."